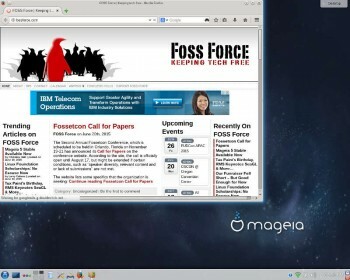 Mageia 5, released on Friday and over a year in the making, is familiar territory to those of us who cut our Linux teeth on Mandriva back in the days when it was called Mandrake. That’s not to say that the distro is old or outdated, far from it, but any Mandrake old-timer will instantly recognize the roots of this distro. That’s a good thing. In this age when the distro gene pool is mostly based on two families, either Debian/Ubuntu or RHEL/Fedora, it’s good to see some other branches of the Linux family tree thrive. Of course, there are others: SUSE and Slackware come immediately to mind, as does PCLOS, which also started life as a Mandrake fork, but within a release or two had moved so far in its own direction that it was no longer associated with its parent distro. This seems fitting, since Mandrake itself started as a clone of Red Hat, but within very few releases no longer resembled dear ol’ dad at all — other than the fact that they both relied on RPM packages. The first screen after installing Mageia 5 and rebooting. As soon as I heard that Mageia 5 was available, I decided to try it on for size. I downloaded the “live CD” version, which weighs in at just over 700MB (a DVD version with more apps is also available), and loaded it onto a thumb drive. After that, I booted it on our Symple PC test machine, which has 2GB RAM and a 2.8GHz dual core processor, and ran from the thumb drive just long enough to make sure the USB Wi-Fi dongle was recognized by the OS. When it was, I clicked to install Mageia’s latest and greatest on the hard drive. Installation was pretty standard fare and quick. Within about ten to fifteen minutes, and a dozen or so clicks, Mageia 5 was up and running. Unlike many modern distros, Mageia’s installer prompts to create both a root password and regular user account. The firewall setup utility in the Mageia Control Center. I chose the KDE version of the distro for a couple of reasons. First, Mandrake was always a KDE based distro, so KDE is in Mageia’s DNA. 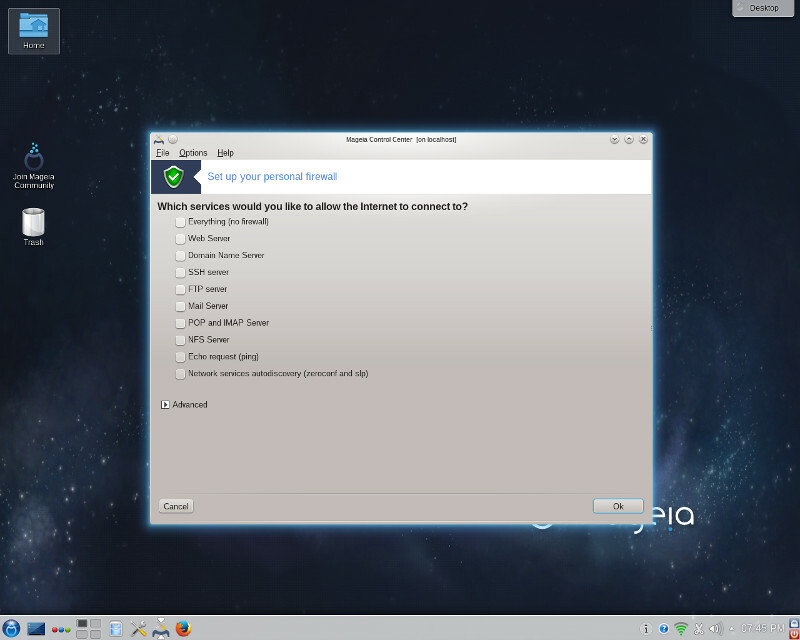 The second reason was because KDE has a reputation for being a resource hog, and I wanted to see how it would do on a machine with somewhat limited resources. The verdict: It does just fine. I’ve been running Mageia on the test machine for two and a half days now, with nary a glitch or any nasty little bugs raising their heads. It’s stable and fast. As a matter of fact, I’m writing this review and editing all of the screenshots on it. The main trouble I’m having? The keys on the old keyboard I’ve connected to this machine keep sticking — which, of course, has nothing to do with Mageia. Firefox 31.7.0 in Mageia 5. Again, anyone who used Mandrake back in the early years of the 21st century would immediately recognize Mandrake as being part of this distro’s lineage. The old Mandrake/Mandriva Control Center is here, now called Mageia Control Center, with much the same look and feel it had back in the day. It’s actually pretty nifty, a one stop shop for handling nearly all system configuration needs, from setting a firewall to networking with other computers — be they Windows or Linux — to manually configuring any stubborn hardware that refuses to plug and play. The Control Center has been updated, of course. Mageia has kept up with the times, and a lot of tasks that once had to be handled manually are now automated — just as with other mainstream distros. And these days, it’s not a big deal to be able to configure a Linux box through a graphical interface — meaning the Control Center no longer has the “wow” factor it once had. There’s one area I’ve found, however, where a Control Center tool could use a little updating, just from a usability standpoint. For some reason, the graphical application installer doesn’t come preloaded with Mageia’s repositories. Although installing them is a simple one-click process, it’s not very intuitive. I spent five or six minutes trying to figure this out, then easily found the answer online. I’m a longtime Linux user, so if I experienced a little bump, how much more difficult is this for new users? But that’s just a little thing — and I’m not here to nitpick. 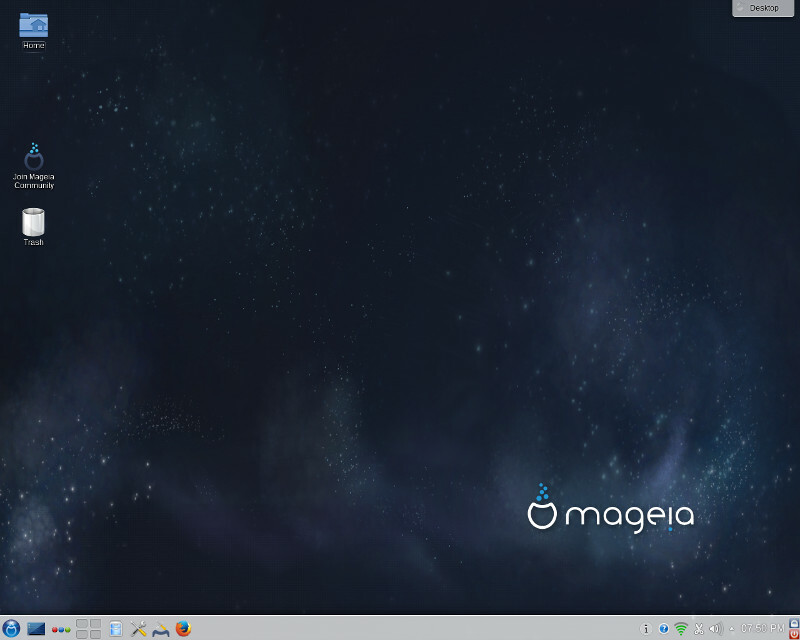 Other than that, I’ve found Mageia 5 to be a fine, easy-to-use distro with plenty of spit and polish, a distro I’d have no trouble recommending to anyone. Indeed, it would be near the top of my list of recommendations for anyone who’s looking for a distro that isn’t derived from Ubuntu/Debian or Fedora/Red Hat. It’s stable and well maintained, with a strong user community. Is it beautiful? I suppose that depends on who you ask. There’s no doubt that most commercial artists would approve of the sparkle and eye candy, but to me the beauty of any Linux distribution is in how it functions — it’s stability and speed, as well as the ease in which it gets me from start to finish when I’m working on a project. By that measure, this is about as beautiful as a distro can be. 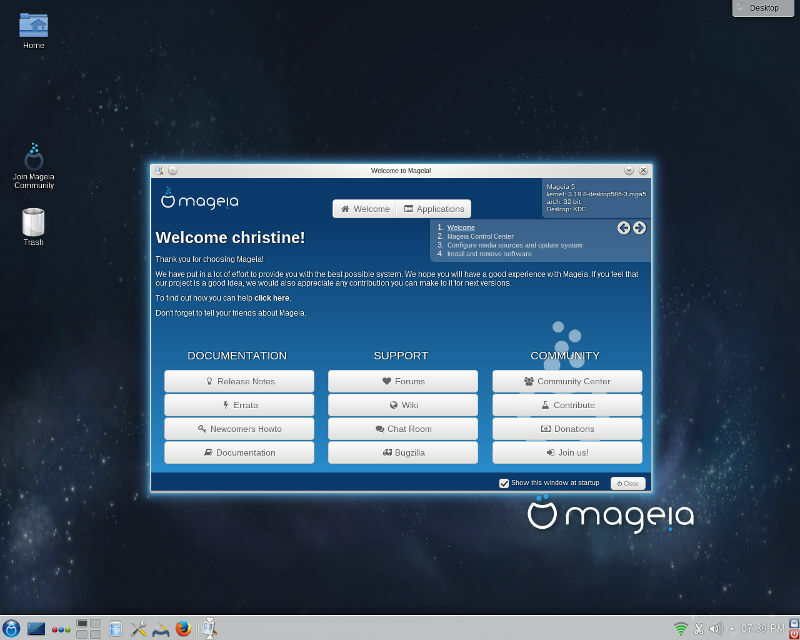 I also must give Mageia’s user community a big thumbs up — especially in the support they offer to new Linux users. 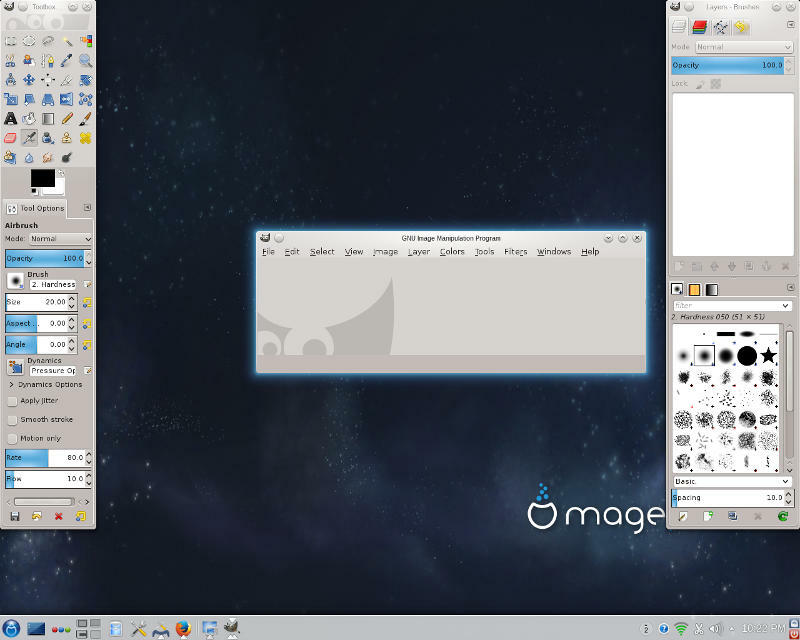 GIMP 2.8.14 in Mageia 5. I subjected the Mageia community to a test yesterday, just to see how they react to new Linux users with limited technical expertise. I opened an account on the user forums under the name “crazynewbie,” and asked a question about an issue I was sure they’d covered many times before, echoing the bump I’d hit with the package manager. I purposefully posed the question with the vagueness and lack of specifics you might expect from a newbie, then sat back and waited to see if I’d be flamed. The question was answered within a half hour — politely and to the point. I wasn’t reprimanded for not searching to see if the question had already been asked, nor was I told to RTFM. I’ve conducted this same test on support forums at other distros with much less satisfying results. Does this mean I’m planning on adopting Mageia as my distro of choice? If I were shopping for a new distro I might, but for the time being I’m happy with what I’m using. I am considering, however, installing Mageia on one of the older laptops I have lying around. Why? Unlike with Debian derivatives, with a simple “telinit 3,” Mageia will drop down to a real honest-to-goodness runlevel 3, a single user mode without X and with nothing between the user and the operating system but the keyboard. That comes in handy sometimes. Thanks for the write-up Christine. Just a quick note as a follow up. You should find the online medias are configured during the installation process. With live medias this happens after the reboot just prior to configuring the users. i do believe i may try it out. Perhaps plasma. Mandriva was the first distro i ever tried. @Lizbeth: If you’re referring to Plasma as in KDE4, then OK; please notice they have a note that Plasma5 is usable, but still somewhat experimental. Let’s not have again the same turmoil with KDE5 that happened with KDE4! I tweak Mageia a lot to make it fit my tastes (because, yes, KDE comes with that basic but tasteless Windows-like configuration). and what I managed to do by removing some services which are still started, even if you toggle them off! I’ll be moving to 5 soon. I’ve been using Mageia since v2 and have not had any issues. It just works. Besides using it for my email and web browsing, I do a variety of other things; eg, web development, create a variety of documents (brochures, pamphlets, presentations), graphic design, scanning, image editing, and work with Audacity. When I’ve had questions, I’ve searched through the forum and always found an answer. While reading other questions and answers, I have not seen any flaming or RTFM comments (this over a period of years now). So for me, the Mageia experience has all been good. Weird the issue with graphical software manager (rpmdrake) is one of the must in each instalallation i did. Thank you for the review. I’m a long-time mandrake/mandriva/ mageia user. (early 2000’s). I was very happy to see mageia appear after mandrake/mandriva started having so many problems. One LONG standing problem I have with mageia is their drakwizard.. it has not been updated since mageia-3.. for example, it does not work at ALL for setting up a DNS server… I still love the distro though. What a nice review for Mageia, Frankly, Mageia is more Mandrake/riva than Mandrake/riva! After, Mandriva Management Gutted the company and continued development with a team of devs in Russia ( I think the Devs of the former Mandriva based “Rosa” distro.) So, All the Developers, maintainers, document people ect. got together with the Mandriva community and forked Mandriva and created Mageia. Thus, the Mageia people are the long time maintainers/creators of most of the Mandriva OS in the first place, essentially forking their “own” work as a community based distro without the restrictions of corporate oversight to restrict them from making the best distro possible for the community. I followed The developers away from Mandriva, and started using early 0. betas and haven’t looked back, I have been a Mandrake/Mandriva/Mageia user since Mandrake 5.3 and having Mageia become a community distro is the best thing that has ever happened to it. It is more stable and easier to use. not having to wait for cool software or new versions of essental programs till the next version of the distro to appear in the repositories is refreshing. SO, even though Mandriva has liquidated the company, IT’s TRUE heart still lives in Mageia. I apologise if there are any errors in my narrative, but, that is the way I see it. @Lance You folks are obviously doing a good job. Keep up the good work. @Lance – You are doing a great job! I started the v5 update on my main machine last night before going to bed. Everything went smoothly. V5 was waiting for me in the morning. Two more machines to update. I am just a very happy and long time Loyal end user, I am in no position to accept any credit for all the hard work The people from Mageia have done. But, I have to agree, Mageia, and all the people that make it happen deserve all the accolades they can get for an excellent distro that, In my opinion, once it became free of corporate maneuvering and silly restrictions, is now able to spread it’s wings and become what it was meant to be. A linux distro that doesn’t get in the way of itself, is easy for a newbie to use, but, doesn’t restrict a power user. And on a personal note, they still do something that I really prefer over distro’s like Ubuntu, mageia has you setup a root user password. I really prefer that so much more over sudo. 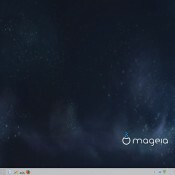 The only concession that Mageia makes with that is the distro updater in the tray, it is the only app in the whole dostro that asks for your regular user password do install updates. I take that you chose to buy that machine with deliberation, because that is the money-savvy decision. I’d do the same thing. I’m not against 64-bit CPUs, but I simply fail to see why the widespread preference for it (except for the need to make already sold computers obsolete, that is). Text processing, music, TV-resolution videos, financial spreadsheets, small-to medium sized databases, browsing, VOIP, video calls, etc. etc. — 32-bit computing has been enough for all that. If one deals with Lab Physics, or Video production or High-performance gaming, OK, 64-bit is necessary. It seems to me we’ll have a longer transition than we had back when we went from 16-bit to 32-bit, because there are less benefits. If someone has a different perspective, I’d like to learn about it. Provided that readers are exclusive GUI desktop users, this article was informative, however, what about terminal users? Specifically, I’m curious if the writer knows how to use the CLI, and, if so, did sudo have to be installed first before she could use terminal instead of the desktop GUI? Maybe I don’t understand the question, but, why would you have to install sudo to use the cli? and you can access the command line without having to run any kind of gui, and you can access root functions by typing “su” and then the superuser password when asked. 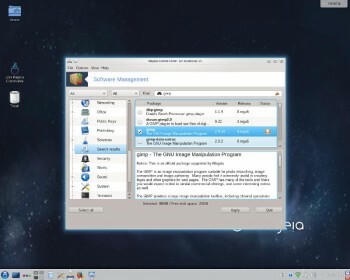 Then is “feature” of the live instalation in the classic installation exist a step to add the online repositories. live media installs will add online medias automatically on first boot after install if it detects available internet connection. that wont work with wireless only connections unless you configured it before you started the install. @Christine: Polite and to the point … you’re welcome 🙂 Answer usually depends how you ask the question, and on the attitude. @tmb and @doktor5000, also its not supposed that MageiaWelcome also must fix that, its MageiaWelcome included in live CDS ? The one major Linux platform popularly supported for many years now is Gentoo , with at least 3 derivite distributions. I strongly recomment that those writing about Linux and Free/Open Source Software (FOSS) do not start developing limited memories or knowledge on such vital and “broad” ecosystem. Never use just su. Always use “su -“, otherwise there is a risk that any program that updates config files will change the ownership of those files to root:root, which will cause problems for the regular user later. Or use just su -c “command here” that you need to do if you install or copy something from home to system dirs,without normal user settings files go to owned by root. The useful trick with Mandrake/Mandriva was easyurpmi. As soon as I rebooted after any instalation, my first next step was to head to http://easyurpmi.zarb.org where my system was auto recognised and the appropriate scripts to install my selected repositories were downloaded and installed. Standard repositories and also the plf (Penguin Liberation Front) which gave access to rpms of non-free programs like Flash and acroread. This was seriously cool. I used to pay a club silver membership for two reasons, to contribute to the development costs and also to be eligible for the PowerPack version downloads. I defected to OpenSuSe only because the developer of QlandkarteGT uses that Distro, and so I was always on the bleeding edge of that outstanding mapping program. Mageia 5 is by now one of the most good release based on rpm. With Mageia, there are nonfree and tainted repositories, instead of needing to use a non-mageia repo. I should have added, acroread is no longer in the repos due to licensing changes by adobe.